For 29 seasons I served as the "spiritual caretaker" for the Toronto Blue Jays, working under the umbrella of a great organization, Baseball Chapel. 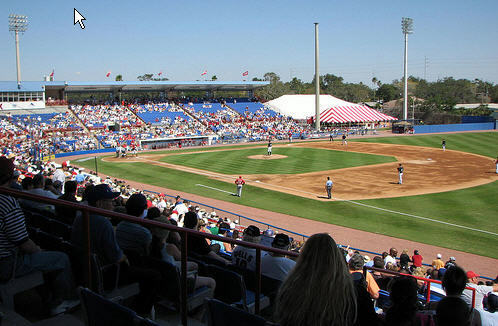 That meant annual spring visits to training camp in Dunedin, Florida where I always welcomed that first "crack of the bat". The spell of winter's wearing off. and feet stomps in the stands. The vendors' cries, the ump's "yeer out!" and cheering of the fans. with spring a new day dawns with hope. Regrets are in the past. Grace offers brand new starts. Thanks for posting my Spring Training poem, David. I am always honored (and humbled) when you share my work with your readers. Blessings on your day, my friend! Great poem with a great message! Also, this is the first time I have seen your new photo heading - "Fabulous!" May God continue to richly bless your ministry for Him.